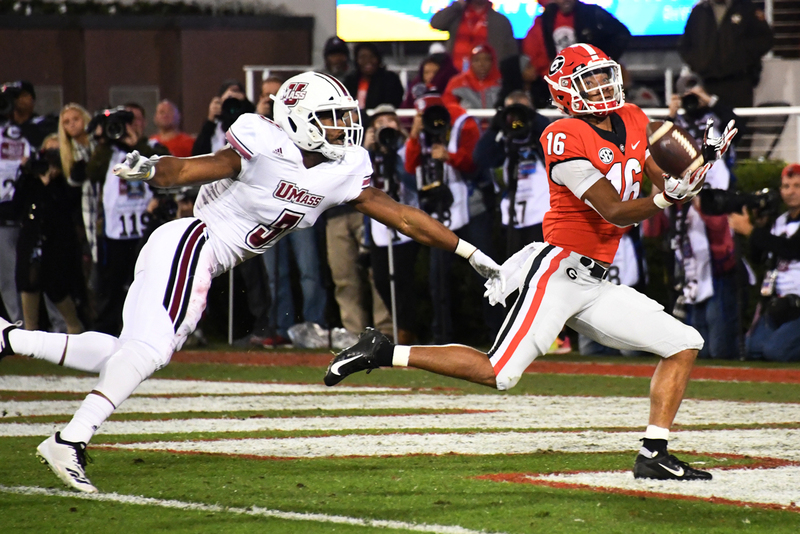 The UMass Minutemen lost 27-66 to the UGA Bulldogs in Athens on Saturday. There’s something deranged about watching the University of Georgia playing the University of Massachusetts at Amherst in football. Is this sport? Hell, I could jump off the back of my couch, drunk, declaring that I’m going to break my fall with a ping-pong table and call it a “sport.” People are paid perfectly good money to do things like that, same as playing football. The odds of my success would have been just as good as UMass’s. It’s just as futile a gesture, and we’re all going to be a little sadder for the experience in the morning. Let’s be clear: The UMass Minutemen are the ping-pong table in this scenario. Or maybe they’re the guys in the Russian dash cam videos who jump in front of cars, hoping to get run over so they can collect the insurance money. Only this time the driver was in on it. I bore witness to this depravity in person on Saturday, tickets courtesy of a state senator with enough sense to have something else to do, my UMass alumni t-shirt used for the first and perhaps the only time in an official capacity in the state of Georgia. I found myself picking out the random Massachusite in the Athens bars, pre-gaming hard. People flew down, they told me. It’s snowing in Massachusetts, after all. It’s always snowing in Massachusetts. 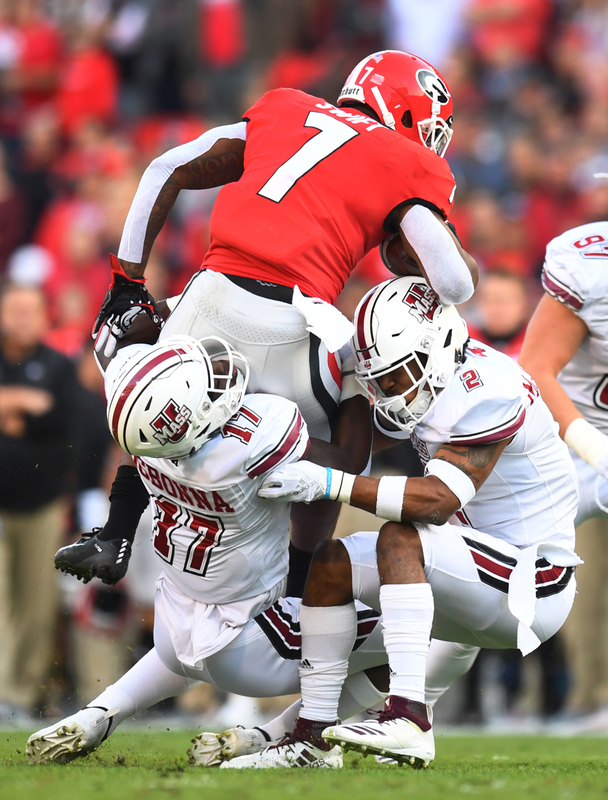 DAndre Swift of the Georgia Bulldogs is tackled in the second quarter by Chinedu Ogbonna and Brice McAllister of the Massachusetts Minutemen on November 17 at Sanford Stadium. These crimes against sport are being committed because New England’s safety school has an inferiority complex. In a state with a dozen internationally famous private universities, UMass is where middle-class Massachusetts sends the kids with brains but too much money for financial aid. It’s like Georgia without a HOPE scholarship and a decent alumni network—and without the jocks, because they all go to Boston College. So UMass decided to try for a little attention in 2012 and moved up to Division I football. It has been an unmitigated and entirely predicted disaster. The Minutemen are 17 and 56 over five seasons. The school can’t give away tickets for a team that routinely loses by 40 points a game. Last week, UMass managed a kick for zero yards against Brigham Young. UMass lost to Florida International—Miami’s equivalent to Georgia State—23-64. UMass doesn’t even belong to a football conference anymore because who wants . . . this? UMass are drunken men on a street corner offering to let passersby kick them in the balls for a dollar. And Georgia stepped up. The University of Georgia paid $1.5 million for the privilege of murdering UMass on Saturday. It’s a rounding error for Georgia’s athletics department. But that $1.5 million represents about a sixth of UMass’s ballooning football budget. The difference is that Georgia is good for it. Its football program makes money, because the seats at Sanford Stadium are packed. People show up for games in tricked out campers with UGA Bulldogs professionally stenciled—and licensed, by God—wearing $300 worth of Georgia gear. More people almost certainly attended the game at Sanford Stadium, with its 92,746-seat capacity, than all of the home games UMass has played this year combined. Student fees and Massachusetts taxpayers cover about three quarters of the UMass athletics budget. The typical UMass graduate will shoulder about $10,000 more debt than a UGA graduate. About $1,600 of that debt will be to subsidize athletic mediocrity. Not that the University of Georgia has the moral high ground. Georgia built a temple to the sport—and I only call it that with a laugh after this game—and after about a billion dollars spent over the last 38 years have no national championships. All to lose to Auburn or Alabama or Florida, or every once in a while, Georgia Tech. Georgia’s nose is pressed up against the glass of the window, looking at the toys. Georgia’s fans were incredibly polite as I made my way to my seats. They had the courtesy one might expect of running into a neighbor at the liquor store—nice to see you, my wife is fine, thanks, please don’t mention this in church. An actual contest should engender some sense of drama, some nervousness one might think. Instead, people actually apologized to me. And they should have. The anxieties are there, though, under the surface: the creeping fear of inadequacy. UMass scored an improbable touchdown in the first quarter on a flubbed Georgia punt return. I stood up and shouted “Imagine that! Ha! They said it couldn’t be done!” and for one brief moment, I saw it. A towheaded boy of about eight sat on the bench in front of me. He turned, wordless, and just stared at me like an axe murderer with ambitions. Saturday was a war of anxieties. Midway through the third quarter, with the score 50-something to who effing cares, a guy in a Massachusetts shirt climbed into the sacred hedges of the Sanford Stadium sidelines to scream at the UMass athletics director. I talked to him afterward. The sage advice of a guy five fingers down a Johnny Walker bottle couldn’t be worse than what was happening on the field. He graduated from UMass in the 1980s, he told me. He met his wife at UMass. He lives near UMass. His five kids go to UMass. He drove down for the game. He camped out along the road in Virginia on the way. It’s snowing in Virginia. “They need to fire the coach,” he said. I looked up at the scoreboard. In the time it took me to walk over to him, Georgia had scored another touchdown. “I don’t think the coach is the problem here,” I replied. But get rid of the program? Never. It doesn’t matter that the faculty, half the student body, and a lot of alumni think this is stupid. This man’s pride is at stake. When there’s hell to pay for acquiescing to sanity, he’s going to be one of the toll takers. College administrators put those hedges up for a reason. Georgia opens against Arkansas State in 2019, paying $1.8 million to do so. UMass plays Auburn in 2020, earning $1.9 for the privilege. Why does Rice play Texas? For the money, Jack. For the money. George Chidi, a former staff writer for the Atlanta Journal-Constitution, works on social policy related to homelessness, mental illness, and substance abuse problems in downtown Atlanta.